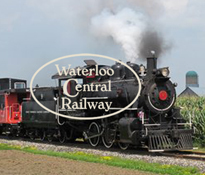 The Waterloo Central Railway is a volunteer-run, non-profit heritage tourist railway operation based in Waterloo Region. The railway offers regular seasonal service between the St. Jacobs Farmers Market, the Village of St. Jacobs and the Town of Elmira. Whether you want a quick trip back in time, a trip to the market, or a full day's outing, the Waterloo Central Railway has something for you. The Trip begins with the anticipation of riding in a living piece of history, discovering everything that there is to know about how this railway works. Explore and learn about the equipment and history while watching the volunteers in action. Catch a ride the whole family will enjoy!